Rifled weapons include handguns – pistols and revolvers, and rifles. The following section describes the wound characteristics of these types of weapons. An important aspect of describing and documenting gunshot wounds is the ability to recognise not only whether the wound represents an entry or an exit wound, but also from what range the weapon was discharged. Use the mindmap below to see how gunshot wounds fit into the 'bigger picture' of the forensic classification of wounds and injuries. When a bullet hits the skin surface, it causes indentation before perforation. Following perforation, elasticity causes the skin to recoil, and the resulting round, circular defect is of a slightly smaller diameter to that of the bullet. An accurate estimation of the calibre size cannot therefore be made from measuring the radius of the wound, unlike in the movies! The mechanical passage of the bullet through the skin causes abrasion, and the circular defect is lined by a rim of abrasion – the abrasion ‘collar’. This tends to dry out like all abrasions, and may be easier to discern with the passage of time (more useful to pathologists). Lead alloy based bullets and ‘dirty’ bullets may also leave a greasy rim (‘bullet wipe’) around the entrance defect (Besant-Matthews 2000, DiMaio 1999, Dana and DiMaio 2003). Another feature of entrance wounds, of short to intermediate distance is the presence of powder markings or ‘tattooing’. Powder tattooing results from the forceful in driving of powder into the skin, whilst ‘stippling’ is the term used where the powder causes impact markings only. The abrasion collar can also be of use in approximating angle of fire – if the bullet impacts perpendicular to the skin surface, it will be round, but if the bullet hits at an angle, the abrasion collar will be uneven, and more distinct at the point of bullet entry (Spitz 1993). Higher velocity bullet wounds may exhibit less of an abrasion collar, but may have minute tears around the wound entrance. If the wound is made over bone, the defect may not be circular at all – these wounds tend to be stellate in shape with ragged and torn edges caused by the overstretching of skin and tearing under tension (Dana and DiMaio 1999). In a review of contact gunshot wounds to the head, from handguns, rifles and shotguns, Faller-Marquardt and Pollak (2002) described the presence of 'stretchmark-like skin tears' of the facial skin around the mouth, forehead, submental region, around the eyes, and within the naso-labial folds. Shots in the mouth also gave rise to radial tears in the skin around the mouth. These stretch marks and tears appeared to follow the lines of tension (Langer's lines), and they postulated that they were caused by subcutaneous or intra-oral expansion of muzzle gases and/or the radial forces of the bullet causing 'ballooning' of the facial soft tissues. At the end of a bullets range it begins to lose axial stability and may tend to yaw and possible tumble end-over-end. If this happens, or if the bullet strikes an intermediate target (including another part of the victims body in a re-entrant wound) and becomes deformed, the resultant entry wound may be very irregular, or even slit-like, and not resemble an entrance wound at all. Careful examination of the wound edges, however (with a hand lens and good light source if necessary) may reveal inverted wound edges and a variable abrasion rim, revealing it’s true nature. As will be described in the range of fire section, secondary projectiles from the muzzle of the weapon, such as hot gases, soot, powder and metal fragments from the barrel or the bullet casing etc can also give rise to characteristic wound patterns, and their presence can assist in the determination of whether or not a wound is an entrance or exit wound. When a bullet impacts bone, it is also possible to infer whether the overlying tissues have suffered an entrance wound, and to some extent at what angle they were struck. The outer table of the skull, for example is punched inwards, creating a circular defect (or a ‘keyhole’ defect if the angle was less than perpendicular), whilst the inner table exhibits a rough chipped or bevelled defect where the amount of bone displaced covers a larger area than that lost at the outer table. (For a review of the characteristics of gunshot wounds in the skull, see Quatrehomme and Iscan (1999)). Skull showing 'keyhole' gunshot trauma. Civil War Collection, National Museum of Health and Medicine, Armed Forces Institute of Pathology, Washington, D.C. These features can also be seen in other bones – particularly flat bones such as ribs and phalanges, although they are not nearly so obvious (Dana and DiMaio 2003). Thali et al (2002 (a)) describe the use of high speed photography combined with their ‘skin-skull-brain model’ to investigate the creation of entrance wounds, and to delineate their morphology. Abrasion ring (schurfsaum) – symmetrical, concentric ring around the central defect during a head-on impact of the projectile. Tangenital shots result in asymmetric abrasion rings with the semi-lunar abrasion or broadest width pointing toward the gunshot’s origin. This is attributed to contact of the exterior of the projectile with the skin. The head of the projectile causes tissue destruction on impact, whilst the periphery suffers irreversible compression. The ring of contusion is analogous to the temporary cavity in soft tissue. The tissues found at the periphery of the cone shaped crater are overstretched and cause bleeding beneath the skin. In general, exit wounds are larger than entrance wounds. They are also more irregular in outline, and their edges are everted. They exhibit no abrasion collar, and they do not have any features of secondary muzzle product projectile impact, such as soot soiling, or powder tattooing (Besant-Matthews 2000; Knight 1996). As the bullet travels through the body it looses kinetic energy, and looses stability. As it exits, it may do so at an angle, or the bullet itself may have been deformed in the body, for example after striking bone. The exit wound in such circumstances may resemble a knife wound or a laceration caused by blunt trauma. In addition to the wound caused by the exiting bullet, secondary projectile damage may be caused by fragments of bone, particularly in headshots. Muzzle velocity is of vital importance when considering the characteristics of an exit wound – high velocity rifles rounds, for example can pass straight through the body unless they strike bone, and if the round has not been deformed, the defect can be rounded. There exists a particular type of exit wound that often causes problems with interpretation. This is the ‘shored exit wound’, and arises where the part of the body being exited by the bullet is supported by tight clothing or a structure such as a concrete floor etc (DiMaio 1999). An exit wound that is at the level of a brassier support, or a trouser belt for example, may be irregular in outline, and have abraded edges. Care must be taken in such circumstances to examine clothing and obtain details about the circumstances surrounding the shooting, as well as looking for other wounds consistent with an entrance wound before a shored exit wound is described as anything else. Rifles give rise to the same sorts of entrance and exit wounds, but the higher velocities involved inevitably lead to larger wounds. When the edges of an entrance wound are brought together, there is always a central defect, or a missing area of skin – this is not the case with an exit wound, unless there has been massive tissue destruction, and a piece of skin has not been located. hollow point handgun ammunition - what happens to the bullet? An assessment of the wound characteristics can give a rough estimate of the range of fire, but the only method of gaining a more accurate assessment involves the test firing of a suspect weapon and ammunition, and comparing patterns of soot soiling and powder deposition etc with those seen on the skin surface, and on clothing (Spitz 1993). A contact wound is described as a ‘hard’ contact wound where the weapon has been pressed firmly against the skin surface. The action of pressing firmly causes underlying tissues to be compressed and indented, and forms a seal around the weapon’s muzzle. This seal prevents the escape of the gases of combustion and soot deposits etc from the barrel of the gun, and they are forced into the wound track (DiMaio 1999). The muzzle becomes hot following firing, and where contact is made with clothing interposed between the gun and the body, synthetic material can be melted, and cotton fibres torn. If contact is made with unclothed skin, searing or burning of the wound edges occurs. Hard contact wounds often exhibit muzzle imprints surrounding the central hole. These arise where combustion gases force the skin to balloon outwards at discharge, and the skin is forced around the end of the muzzle. The skin is abraded and bruised, and may give a fair representation of the outline of the muzzle, including identifying features such as the weapon’s site. The skin bulges and presses against the muzzle in a contact shot. The skin is split. Contact discharges also exhibit cherry-red discolouration of wound track tissues caused by the release of carbon monoxide from the muzzle that causes the formation of carboxyhaemoglobin and carboxymyoglobin in the subcutaneous tissues. Where rifled weapons are discharged in hard contact with the head, the muzzle gases and contents are forced into the potential space between the scalp and underlying bone, and the edges of the entry wound are forced outwards and the resulting wound is often stellate in appearance, with ragged splitting of the wound edges. Wound edges are abraded, and there will be evidence of soot and powder deposition in the wound, assisting in the differentiation between entrance and exit wounds. Contact wounds made by higher velocity rifles cause massive destruction of the head due to the explosive effect of the expanding gases leaving the muzzle. Centre fire weapons produce more destruction than rim fire weapons, in general, and where the torso is the point of entry, there may be massive internal disruption at a distance from the wound track. When the muzzle of the weapon is not held in such close approximation with the body (for example due to the interposition of clothing or hair between muzzle and body), there exists an escape route for some or all of the muzzle gases and discharge products. These can form secondary projectiles, particularly powder flakes or debris, and metal particles from the barrel of the weapon or bullet casing etc (Dana and DiMaio 2003, DiMaio 1999). Entry wounds made in these circumstances can be seen as circular defects surrounded by a large amount of soot soiling. However, there is still not enough room for the deposition of powder except perhaps within the wound edges themselves. In addition, heat searing or burning of the wound margins is minimal. Muzzle imprints are also unlikely to be found. Heat searing of the wound edges may also be seen, and hairs may be singed or ‘clubbed’, where their keratin melts at the tip and re-solidifies as a 'blob' (Knight 1996). Contact wounds arising from the weapon being discharged at an angle to the body’s surface may demonstrate features allowing the angle of fire to be assessed. For example, if the angle of discharge allows gases to escape in one direction (the direction in which the weapon is being discharged), the pattern of soot staining and wound edge searing will exist only on the side of the wound at which there was enough of a gap to allow the passage of discharge products to exit. The resultant shape of soot soiling etc can bethought of as a teardrop shaped pattern. If the angle is acute enough, there may be enough distance for there to be deposits of powder flakes or particles. These give rise to so-called ‘powder tattooing’, where particles of powder impact the skin and cause punctate abrasions and bruising. DiMaio (1999) prefers the term 'stippling' to describe multiple punctate skin abrasions caused by the impact of fragments of foreign material, and where this material is gunpowder, he uses the term 'powder tattooing'. Powder tattooing may also be simulated by various materials - 'pseudo-soot' - and DiMaio (1999) describes such materials as fingerprint dusting powder, graphite, powdered asphalt and powdered lead as causing interpretive problems. ‘Near contact’ wounds are those produced when the muzzle is not quite touching the skin surface, but is not held so far away that there is sufficient distance to allow powder tattooing to take place. As the range of fire increases, features of intermediate range wounds are seen. There is a gradual reduction in the amount of soot soiling seen around the wound, as well as a reduction in the amount of heat searing. Soot soiling is generally seen up to about 15 cm whilst powder tattooing can be found at up to 30-45 cm. These distances can be doubled for rifles (Knight 1996). The length of the barrel also has an effect on the area of skin exhibiting soot soiling – a snub nosed revolver for example will spread soot over a larger area than from a pistol with a longer barrel. (Spitz 1993). The use of silencers on handguns reduces the area of soot soiling and powder tattooing, and cause difficulties in determining range of fire. However, powder particles leaving the muzzle are able to impact upon the skin surface, giving rise to powder tattooing – at a distance of about 10 mm from the average handgun muzzle. Where small fragments of metal from the bullet or the barrel impact the skin surface, the term ‘fouling’ is used. These fragments are not easy to remove (unlike soot which can be wiped off), and where the victim survives an inflammatory reaction occurs to these foreign bodies (Spitz 1993). Unburnt explosive flakes may also be seen – small glistening and often coloured particles, depending upon the manufacturer. The pattern of tattooing again depends upon range of fire, and as range increases, the areas of skin tattooed increases up to the point where powder particles exiting the weapon do not have enough energy to reach and impact upon the skin surface (approximately 60 – 120 cm, depending upon the powder type). If the bullet enters the body at a very acute angle, it may travel just under the skin surface before coming to rest – when this occurs there may be a series of interrupted surface bruises that follow the track. Intermediate range rifle wounds still result in massive internal damage. When the muzzle to skin distance is beyond the range of powder deposition, circular defects are seen with an abraded rim, but with no associated searing, soot deposition or powder tattooing. The abrasion rim may be missing where skin overlays a bony support (Besant-Matthews 2000). Distant shots from rifles may result in a central defect with micro tearing of the wound edges, and massive internal destruction. Assessing whether a wound is self-inflicted is assisted by knowledge of epidemiology. The most common site for gunshot wound in suicide, for example, is the head (74%), usually the right temple (39%), followed by chest and abdomen. Men are more likely than women to shoot themselves in the head. Karger et al (2002) evaluated records of 624 consecutive gunshot autopsies in Germany, and carried out binary logistic regression analysis in order to identify characteristics of suicidal and homicidal gunshot wounds. They noted that females constituted more of the homicide victims than suicide victims (26.3% vs 10.6%), and that more than 1 gunshot was found in 5.6% of suicides (maximum 5 shots) compared to 53.9% of homicides (up to 23 shots). Suicidal gunshots were fired from contact or near-contact range in 89% (7.5% of homicides), and the typical entrance wound sites were the temple (36%), mouth (20%), forehead (11%) and left chest (15%). However, uncommon sites did occur, including the back of the head, eye, ear and nape of neck. They also analysed the wound track in order to identify characteristics of suicide vs. homicide, and noted that in suicidal wounds to the right temple, the majority of tracks were oriented front-to-back and upwards (or parallel), whilst homicidal wound tracks were oriented back-to-front or downwards. Suicidal gunshots to the left chest were oriented right-to-left or parallel, whilst homicidal shots were frequently left-to-right. Shots were oriented upwards and downwards in both groups. It can therefore be concluded that an analysis of wound patterns can give clues to the likely manner of death, but atypical patterns occur relatively frequently, and a full scene examination and multidisciplinary investigation is therefore essential in all firearm deaths. Gunshot wounds to the head are not invariably fatal, and an individual shot in the head may still be capable of making purposeful movements/ actions. An elderly professional man, slightly eccentric and living alone in a small private hotel, went out one winter evening and did not return. His disappearance caused no particular alarm, as his habit of walking around at night was well known. The following morning the bell to the street door rang at half past seven, and the maid answered it. On the doorstep stood the man, wearing a hat and heavy overcoat, and carrying his umbrella hooked over one arm. To her consternation, the maid noticed blood on his face and shirt, but he brushed her mildly aside when she moved towards him. "Don't worry," he said. "It's nothing. I'll just go upstairs and have a wash". So saying he walked into the hallway, placed his umbrella in the stand, and hung up his hat and coat before going up the stairs to the bathroom. The maid followed him up, and saw him collapse. She called an ambulance and the police, and the old man was taken to the Royal Infirmary, where he died three hours later. There was no mystery about the cause of death. 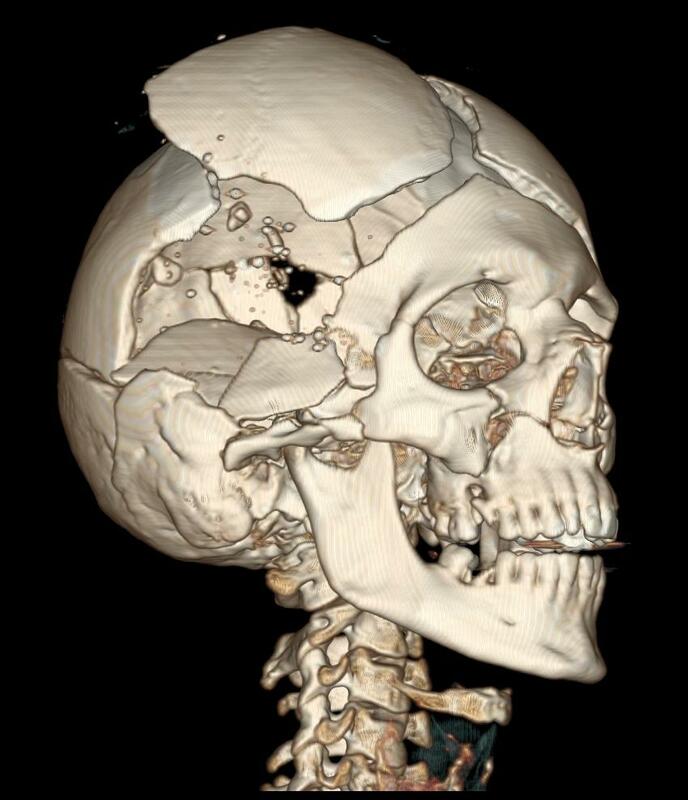 Under the man's chin was a bullet wound, which tracked upwards through the mouth, through the severely damaged brain, and out through the left-hand side of the top of the skull. The exit wound was about one and a quarter inches in diameter, and suggested a .45 calibre bullet with 'tailwag'; powder stains in the mouth itself seemed to indicate that the man had placed the gun under his chin and pulled the trigger. The police went back to the hotel and, in the freshly fallen snow, traced bloodstained footprints across the road to a small public garden opposite, where on the seat of the shelter, they found a .45 revolver, which was later identified as the property of the dead man. In front of the seat was a large pool of blood, and in the roof of the shelter was a bullet hole surrounded by fragments of bone and brain tissue; here was where the act had been committed, but the time was more difficult to fix. The man had left the hotel some time the previous evening and had apparently spent part of the night in the shelter. At six that morning it had begun to snow, and a 165-yard circle of footprints and bloodstains leading from the shelter, out onto the grass, and back to the shelter again, showed that the wound must have been inflicted at around six. Apparently the man had shot himself at about that time, and had sat on the seat with his head hanging forward between his hands, dribbling blood onto the ground. Then he had got up, walked around in a circle, and returned to his starting point once more. After resting a while longer, he had finally risen to his feet, walked straight across the grass and across the street and rung the doorbell of his hotel. When bullets fired from handguns enter the body and fragment (particularly after striking bone), they can be seen on x-rays as scattered radio opaque fragments. However, when a semi-jacketed high velocity rifle round fragments, it is seen on x-ray as a ‘snow storm’ of fragments. Fully jacketed rounds tend not to fragment, and do not have these radiological features. Imaging of gunshot wound victims may also show another surprise feature – bullet emboli, where a bullet, or fragment impacts an artery or great vessel and is carried into the bloodstream to lodge at another site distant from the wound track. However, this is more likely to occur in distance wounds from shotguns where the pellets are embolised. Clarot et al (2003) reported a case of head injury caused by a tear-gas cartridge fired in a suicide. The weapon was an 8mm blank firing pistol loaded with a CS 8mm cartridge. The discharge of blank firing guns or tear-gas cartridges produces a gas jet capable of causing pronounced close range/ contact wounds, often more so than other gunshot wounds, where the expanding gases are able to follow the path of the penetrating projectile – unlike in the case of blank firing weapons. WebPath image - Summary Diagram of skin appearances (top) and bone defects (bottom) - illustrating skull bevelling out away from the direction of the bullet.